Hats, bold-colored tresses, braids and hair adornments rule the Coachella park! Would You Walk Through A Door Marked ‘Average’? 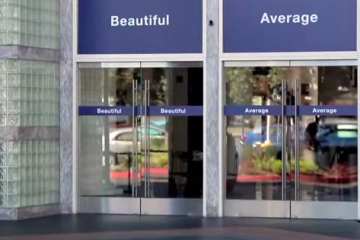 Entry way doors marked “Average” and “Beautiful” were mounted in five major cities around the world: San Francisco, Dublin, Shanghai, London and San Paulo. For days, women walking into work or local stores were— surprisingly to them—confronted with the question: Am I beautiful or average? A film crew caught it all.